Flax is an annual plant that grows to a height of 40 to 91 cm (16 to 36 in. ), depending on variety, plant density, soil fertility and available moisture. 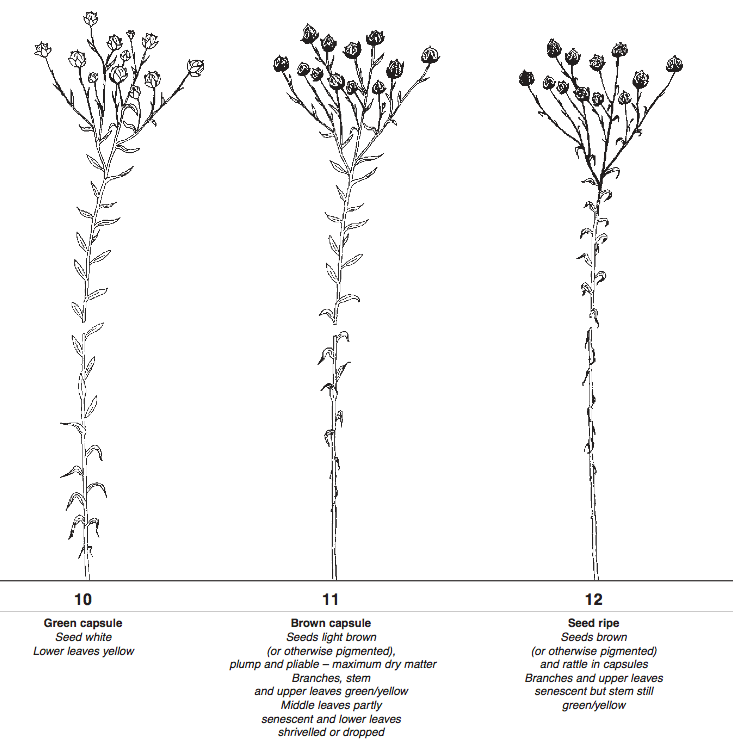 Flax is self-pollinating, but from 0.3 to 2% outcrossing may occur under normal circumstances. Insects are the primary agents of outcrossing. 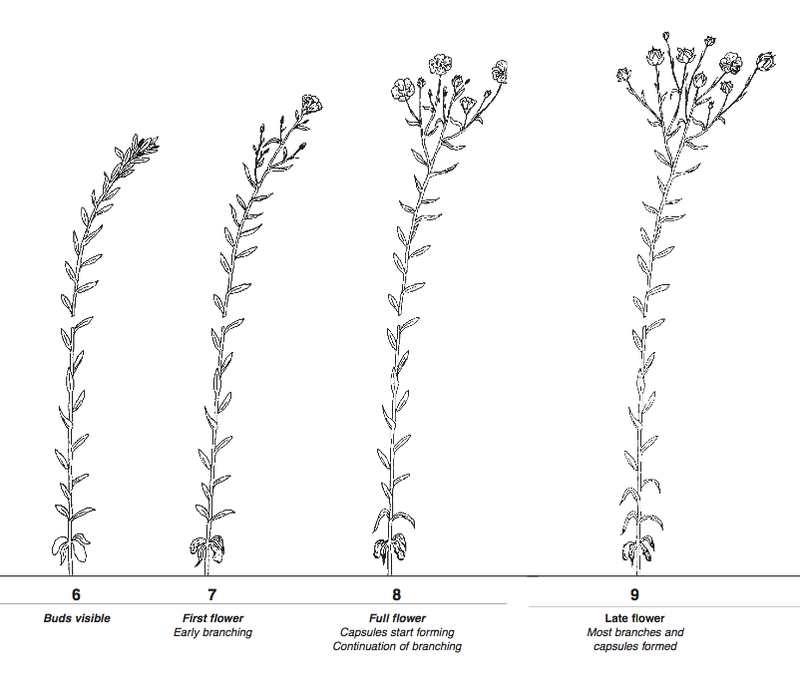 The life cycle of the flax plant consists of a 45- to 60-day vegetative period, a 15- to 25-day flowering period and a maturation period of 30 to 40 days (see Photos 8 and 9). Water stress, high temperature and disease can shorten any of these growth periods. Although there is a period of intense flowering, a small number of flowers may continue to appear right up to maturity. During the ripening process, under high soil moisture and fertility, stems may remain green and new growth may occur leading to a second period of intense flowering. 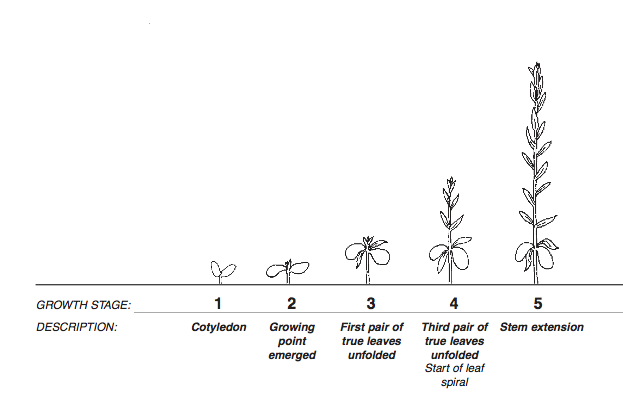 There are 12 distinct growth stages (GS) in the development of a flax plant (see Fig. 1). In the illustration below, these GS’s are shown as numbered line drawings. Each illustration has a title description and, in some cases, additional identifying information. The flax plant has one main stem, but two or more branches (tillers) may develop from the base of the plant when plant density is low and soil nitrogen is high. The main stem and branches give rise to a multi-branched, irregular arrangement of flowers. The plant has a short, branched taproot which may extend to a depth of more than 1 m (39 in. ), with side branches stretching approximately 30 cm (12 inch). Flower opening begins shortly after sunrise on clear, warm days and petals are shed in the early afternoon. The flower parts, (petals, sepals and anthers) all occur in units of five (Fig. 2). Flax varieties may be distinguished by the colour of the flower parts which can range from a dark to a very light blue, white or pale pink. The anthers are a shade of blue or are yellow. The style and filaments that bear the anthers are blue or colourless. The mature fruit of the flax plant is a dry boll or capsule. Ripening of the boll begins 20 to 25 days after flowering. The boll has five segments which are divided by a wall (septum) (Fig. 3). Each segment produces two seeds separated by a low partition called a “false septum”, whose margin may be hairy or smooth, depending on the variety. With complete seed set, the boll contains ten seeds, though an average of six to eight seeds per boll is usual. When ripe, the bolls of Canadian varieties are slightly gaping (Fig. 4), that is, the boll opens at the apex and the five segments separate slightly along the margin. The bolls rarely open so far as to allow the seeds to fall out. Flax seeds are flat, oval, and are pointed at one end. A thousand seeds weigh from about 5 to 7 g (less than 1 oz. ), depending on variety and growing conditions. Seed of different varieties ranges in colour from light to dark reddish brown or yellow. Mottled seed, a combination of yellow and brown on the same seed, is the result of external, environmental conditions and is not an inherited characteristic. The seed is covered with a coating (mucilage) that gives it a high shine and causes the seed to become sticky when wet. At times, this mucilage absorbs moisture from the air, causing the mature seeds to stick to the boll surface. This removes the shine on the seeds, giving them a scabby appearance which results in a reduced grade.